Contemporary wine cellar designs are growing in demand all over the world. At WholeCellar, we’ve built residential and commercial custom wine cellars with metal wine racking. Why are metal wine racks widely-used in wine cellar construction? Well, metal is a very sturdy material, thus wine racks made from this material can last for many years. Not only that, metal wine racks also offer a wide range of designs, allowing you to easily match the existing décor of your home, restaurant, or wine store. Vintage View Wine Racks are probably the most popular among metal wine racks. Using these will create stunning custom wine displays, adding drama to your living space. Easy viewing and good airflow around your wines are other reasons why these metal wine racks are a good option. Whether you want a free-standing or wall mounted wine rack, WholeCellar’s Vintage View metal wine racks will achieve the modern look that you want in your wine storage space. If you need wine racks that will fit the width and size of your space, the ideal wine rack choice is our Evolution Series Vintage View wine racks. Constructed with horizontal steel rods, Label Ladder wine racks are designed and built to last for a long time. These are ideal for commercial wine cellars where custom wine displays are essential in gaining the attention of customers. They are also recommended for limited wine storage spaces. Label Ladder wine cellar racks create the illusion of your bottles floating in space. 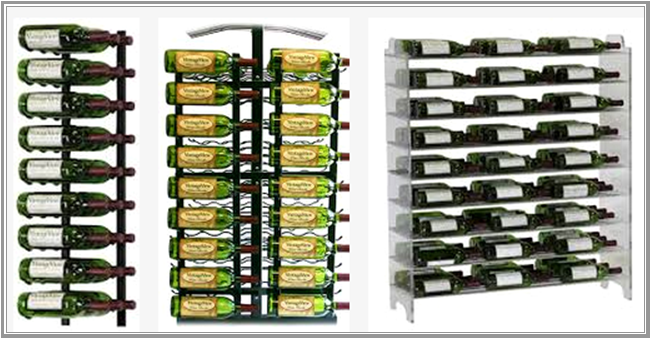 Other advantages of these metal wine racks are design flexibility, customization options, and maximum view of the label. 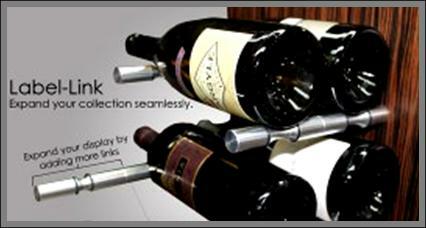 Our Ultra Peg wine racks have been tested to withstand actual conditions in a wine cellar. The pegs of these wine racks are spaced in a way so that they can house large-format bottles. The Peg System is configured uniquely to allow convenience in adding wine bottles to your collection. Just like the Label Ladder Series, the Peg System showcases your bottles like they are floating in the air. This is also the best option if you need a wine rack that will fit snugly into an odd corner or irregular-shaped space. 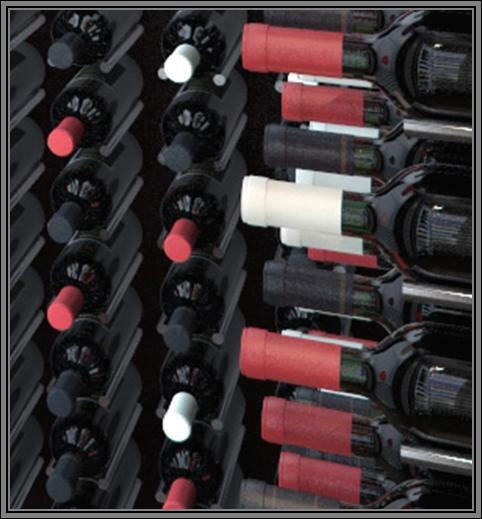 A growing wine collection needs a wine racking system that allows easy expansion as you simply have to add a new link into your existing Label Link wine rack. You can opt for single, double, or triple deep configuration. In addition to being stylish, the Ultra Label Link Wine Rack System is proven to hold wine bottles securely with soft and high quality rubber O-rings. At WholeCellar, we will help you choose the right metal wine racks that you need to achieve the contemporary look that you desire. Contact us now at BillBridges@wholecellar.com or visit our website at https://www.wholecellar.com/. 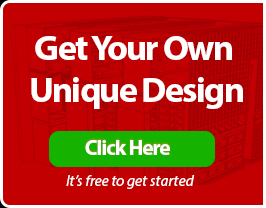 For a FREE 3D wine cellar design, click here.